WHEN WE WERE living in the US back in the ‘90s, October to me was synonymous to fall foliage. For two consecutive Octobers in 1998 and 1999, we journeyed to Shenandoah National Park in Virginia, USA to enjoy its autumn colours. I wrote about it in 2001 which The Sunday Star published on 28th October 2001. My husband has sung it and I have hummed it, but the song never really meant much to us until we visited Shenandoah National Park in Virginia twice during our four-year stay in Washington DC. Just as we looked forward to cherry blossoms in Washington DC each spring, October is much awaited for the glorious burst of fall foliage. 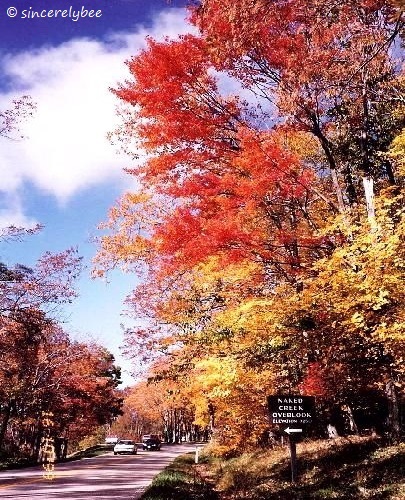 And there’s no better place to experience the spectacular annual displays of reds and yellows than the Shenandoah National Park, which straddles a section of the Blue Ridge Mountains, the eastern-most range of the Appalachians, one of the oldest mountain ranges in the world. It is a place that lends itself to superlatives. The American Automotive Association tour book describes it as one of the most beautiful and historic regions of the East. 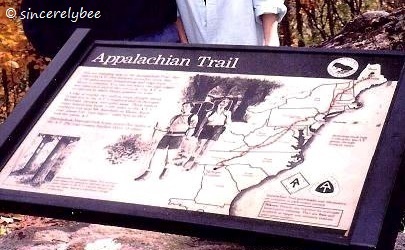 Hikers concur saying the 160km portion of the 3,360km-long Appalachian Trail that runs through Shenandoah is one of the most spectacular. Every October, it transforms into a stage set for some of the greatest diversity of fall colours. They typically peak from the second week of October and last for some 10 days. Situated a mere 115km west of DC, Shenandoah Park is one of the most accessible parks in America. A short and pleasant two-hour drive from DC brought us to Front Royal, the northern entrance of the park, which is also the northern tip of Skyline Drive, a high point of interest here. Entrance to the park is US$10 (RM38) per vehicle, and US$5 (RM19) per pedestrian, cyclist and motorcyclist. We opted for the annual Shenandoah Passport costing US$20 (RM76) that allowed us to return to the park anytime within the year. Our first stop was at one of its three information-packed visitors’ centres. We took some brochures and were impressed with the range of park services and facilities, including those for the disabled. With the brochures in hand, we made our way down south along Skyline Drive, mindful that the 168km winding two-lane mountaintop highway has a speed limit of 56 kph, for a good reason. It allows motorists to drive at a leisurely pace while enjoying nature’s spectacular display on both sides of the road. For most of its length, Skyline Drive is dotted with overlooks where scenic vistas await to be photographed, painted or simply viewed. We stopped at a few of these (with interesting names like Blackrock, Little Devils Stairs, Naked Creek, Signal Knob, Stony Man, among others) and practically soaked up the autumn landscape. (L-R) Pollock Knob (elevation 3580ft) named for George Freeman Pollock, founder of Skyland; A signboard provides information the only tunnel on Skyline Drive that goes through Mary’s Rock Mountain. (24 Oct 1998). Some overlook valleys and rivers while others offer panoramic views of faraway hills and mountains steeped in shades of yellow, red, green, or a mixture of all, depending on what trees are dominant. Scenic views along the drive… including one taken at Trayfoot Mountain Overlook at 2575 ft (bottom pix, 16 Oct 1999). 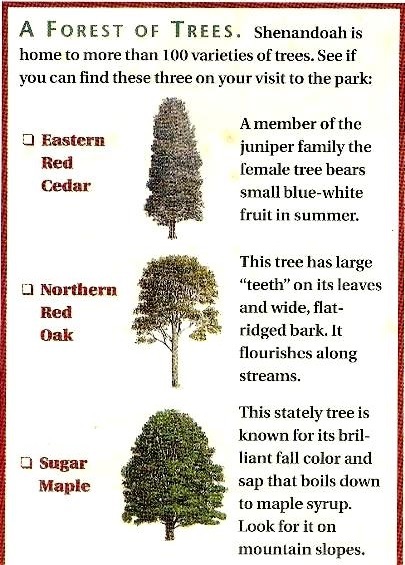 The Shenandoah Park guidebook provided a little lesson on the variety of trees for the uninitiated like me. There are more than 100 varieties here, including sugar maple, known for its brilliant red colour and found mainly on mountain slopes; the Northern red oak that flourishes along streams and hickories and poplars, which give the gold and yellow colours, as do birches and redbuds. Dogwood, sourwood, sweet gum and black gum can either be red or yellow. They are also the evergreen trees that stay just that all year. These forests are also home to some 1,100 flowering plants and sanctuary for many species of birds and animals. Shenandoah Park is not only rich in natural wonders, but also in history. Its geological history dates back one billion years ago, and more than 400 buildings, structures and features along Skyline Drive are listed on the National Register of Historic Places. We drove through the 250m Mary’s Rock Tunnel, blasted from rocks which once lay beneath the earth’s surface, stopped at Big Meadows to admire the largest, treeless area in the park and lunched at one of the seven historic picnic sites. I felt a sense of elation when we arrived at Skyland, and stood next to a sign that said: “Highest point on drive – elevation 3,680 feet.” We toured Massanutten Lodge, built in 1911 and the second oldest building at Skyland. Another significant historic site is Camp Hoover, which was used by President Herbert Hoover as his “weekend White House.” While horse riding during one such retreat in 1930, he is reported to have said, “These mountains are made for a road, and everybody ought to have a chance to get their views from here. I think they’re the greatest in the world and I’ve been nearly everywhere in the world.” This led to the construction of Skyline Drive, which was completed in 1939. Countless adventure seekers and nature lovers have come to enjoy the beauty and wonders of the park since then. Recent statistic shows that Shenandoah hosts two million visitors yearly. Branded as Virginia’s Mountain Playground, it lives up to its name offering a host of activities for children and adults of all ages. Along our journey, we met an avid photographer who makes seasonal pilgrimages to the park to capture the diverse sceneries for his website. We spoke to two elderly couples collecting branches for a campfire and a family with two young children who had come for the horse rides. Some teenagers with backpacks were headed for one of the many nature trails. And there were many like us who just wanted a day out amid the spectacular fall foliage. Shenandoah is best discovered on foot, so they say. Alas, I could only imagine the secluded forest glades filled with wildflowers, cascading streams and hidden waterfalls; ruins of log cabins, barns, fruit cellars, even cemeteries, remnants of the past described in the brochures. However, the annual blaze of fall colours was enough to entice us to return. Again, we simply drove through, making occasional stops to capture better pictures this time round. The roads have since taken us home, but the autumn splendour remains vivid in my mind. This entry was posted in Articles, Discover DC, Travel Back in Time and tagged Travel, USA, WashingtonDC. Bookmark the permalink.